The problem we solve: Medical device loss and downtime due to misplacement are real problems for hospitals. Most solutions are very expensive to install and operate, and they often require hardware to be installed in every room. About our solution: NGEMS is a full end-to-end service, providing hardware installation services, data hosting, and platform support through Software as a Service. 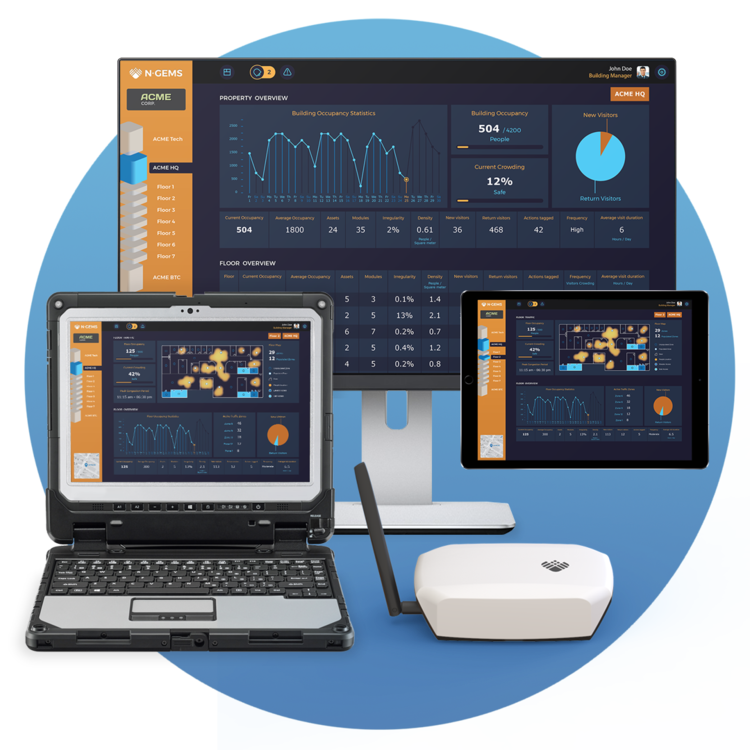 By installing our proprietary NGEMS Modules, we track wifi signals from mobile devices and NGEMS Tags to locate people and equipment to within a zone-level of accuracy. Each set of Modules can scan an area of approximately 6,000 sq. ft. and can cooperate together to offer continuous coverage over larger areas. Our cloud-based analytics engine delivers task-specific information to users through a custom tailored, browser-based interface designed around each individual customer’s needs. If a UI is not required, partners can integrate with NGEMS services through our real-time web service API. We have a fully developed solution including both hardware and software. Our custom hardware includes both wifi sensing modules and device-attached tags. Our software platform is hosted on the cloud and includes web browser access for custom UIs as well as real-time API access for platform integration. Currently we are conducting our first pilot test with hospitals in New Jersey and in collaboration with Sodexo Services. We look to convert that to a yearly subscription within the next two months. Biography: Michael is a former Air Force officer and research scientist where he managed operational contracts and worked on data visualizations with OpenGL. After the military, he worked for six years in the entertainment industry as an actor, writer, and audio engineer. 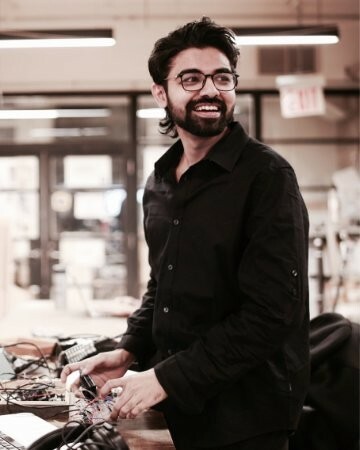 He met Chetan while they both were attending NYU’s Interactive Telecommunications Master’s Program, where he focused on VR and AR technologies. He is responsible for company strategy and spearheading partnerships at NGEMS.co. Biography: Dimos, NGEMS’ Chief Finance Officer, is a native of Greece and just completed his Master’s studies at NYU ITP. His history as a venture capitalist and entrepreneur includes several success stories in the European market, including the popular food.gr. Equipment loss and downtime due to misplacement are real issues that cause complications for hospital professionals on a daily basis. Real-time location services have been documented as reducing equipment downtime by as much as 50%. The costs of installation and operation of these systems often make them cost prohibitive for many hospitals. NGEMS provides the opportunity for these smaller hospitals to reap the benefits of indoor location services without the huge cost typically associated with them. NGEMS service is a great value add for existing inventory management systems. We can augment barcode and room specific RFID systems by providing full floor knowledge of where devices and equipment are located. NGEMS’ real-time API makes integration with existing inventory management systems a button click away. Although not discussed in this campaign, we will be filing patents for our methodology to collect, categorize and classify wifi signals at indoor sites. The funds raised through Medstartr will be used to produce our first production run of custom NGEMS modules using our own PCB design. This will enable us to continue expanding our pilot tests to more partner hospitals. The first $10K will be used to finalize our design with the follow-on $15K used to produce 60 units. Inspired by a tragic loss caused by the tsunami that struck India in 2004, our founder, Chetan, has long been intent on designing a system that can aid rescuers during a crisis. He finally got a chance to focus on these endeavors at NYU-ITP, and began the groundwork for what would become NGEMS in the fall of 2016. As NGEMS evolved from a class project into a real product, many of us were inspired by Chetan’s vision and began lending our expertise to the project. Those unofficial roles became official when NGEMS was incorporated near the end of 2017. While our market research has led us into general indoor location services, NGEMS’ mission is still to deliver life saving information to rescuers so that they can focus and maximize rescue operations. When a disaster strikes, our NGEMS Modules can locate people through their cellular devices and deliver that information to rescue teams and dispatch centers. We ask for your help in supporting our mission to provide life saving information to hospitals rescue teams through real-time location services.